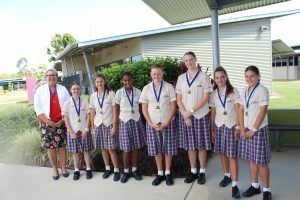 At the recent Mossman 7’s competition, St Stephen’s u13 Netball Team were victorious, scoring the highest points in the round robin and then winning the final against Mareeba State High School 11-5. In the round robin games, St Stephen’s defeated Innisfail State High School 10-2, Mossman State High School 13-2 and Redlynch State College 10-4, but lost to Mareeba State High School 6-8. The team demonstrated great teamwork, determination and effort in all their games, whilst showing respect towards each other, their opponents and the officials. The students were congratulated and presented with their medals at the whole school assembly. Well done team! Coach, Mrs Jodie Jackson with: Eliza Kuik, Alyssa Shorey, Thecla Yow-Yeh, Jessica Reedman, Alyssa Crane, Imogen Devine and Holly Prien.